Now that the dust has started to settle from SteamCon UK for another year, its time to take a bit of a closer look at all that juicy keynote content for Guild Ball. If you want to watch back the full SteamCon UK keynote and Q&A you can find it HERE. With these words, we launched this year’s narrative campaign, the first ever Free Cities Draft. Ten new rookies stepped up to take their place in the Big Leagues, and for seven long weeks coaches from all around the world competed to claim their player in the Draft. A staggering amount of games were reported during this campaign—over double the amount we saw in the Union in Chains event last year. And the tension wasn’t just down to the competition among the Guilds either. Just about every team saw internal disagreement over which rookie would be best for their side, Union meddling was as prevalent as ever, and the Minor Guilds sold their services to the highest bidder. At the keynote for SteamCon UK we revealed the final standings in the Draft… and oh, how the drama unfolded. For those of you who didn’t see the results, here they are again, along with the names of the player each Guild took home on the night—and an explanation of how it all happened. The Farmer’s Guild took the top position in the Draft in the very first week, and never once lost their place. Their dedication to Amber was just as fierce as their determination to finish at the top, the exiled Brewer finishing way above her closest rival. Hats off to the family, you guys really united around your girl and made this event your own! For the longest time, the Alchemist’s Guild looked certain to take Nomad. So much so, in fact, that barely anyone else put in votes for him. But in the final weeks of the event the needle began to shift back to Kami, who had also enjoyed support in the early stages of the campaign. This rivalry propelled the Alchemists up the standings, and claimed them second place in style. In our penultimate update we warned you all the Butcher’s Guild would decide the fate of just about every team below them, and boy did they! The Butcher’s were aiming for Layne, Kami, and Champ in the final week, all of whom were tightly contested by the teams directly below. Support for Layne came out on top… and the repercussions were felt almost immediately. Aware that a pact had been made against them by the Blacksmiths, Butchers, and Hunters, the Mortician’s Guild faced stiff competition in the final days of the campaign. The first team not to claim their first-choice player (Layne), the Spooks were also denied their second-choice player (Edge). Their third-choice was Gaffer, and the first massive shock of the event. Losing their first-choice player was disastrous for The Blacksmith’s Guild. Throughout the event they’d looked sure to get their man, maintaining second place in the standings until the final week. Alas, their coaches were too honourable, lending their strength to aid the dramatic rise of the Hunters, but forfeiting their own standing as a result. They walked away with their second-choice player instead. In a strange quirk of fate, the Mason’s Guild actually took their most popular player, even this far down the standings. We wouldn’t have guessed this Draft given how popular Champ was, but with the Butchers opting for Layne and none of the three Guilds directly above challenging the ruthless midfielder, she fell almost perfectly for them. Good thing too—Kami and Edge were already gone! We warned Fisherman’s Guild coaches they shouldn’t get too complacent way back at SteamCon US. Although they seemed to be the only Guild chasing Cutlass, they took a serious hit thanks to their low standing in the Draft. With Cutlass, Kami, and Champ all gone, they plummeted to their fourth-choice player, Knuckles. And so, that brings the Draft to a close, sports fans! From all of us at Steamforged Games, an extremely heartfelt thank you. You all embraced this event like we could only have dreamed, and really made it an incredible experience. Keep an eye out January for the individual epilogues, and then next year when these players make their triumphant debut in the Big Leagues! These models are now being developed and will be with you in 2019. As was confirmed in the Q&A session that followed the keynote, the Free Cities Draft models will be available to purchase individually when released. At SteamCon US we explained that a new style of OP Kit would be coming for Season 4 which features blind alternate sculpts. Each pack will contain one of four different sculpts which will only be available through this OP Kit. At SteamCon US we showed you a ‘common’ sculpt in the Blacksmith Iron and a ‘rare’ sculpt in the Falconer Ikaros. At SteamCon UK we added to those with another ‘common’ sculpt in the form of the Farmer Ploughman. 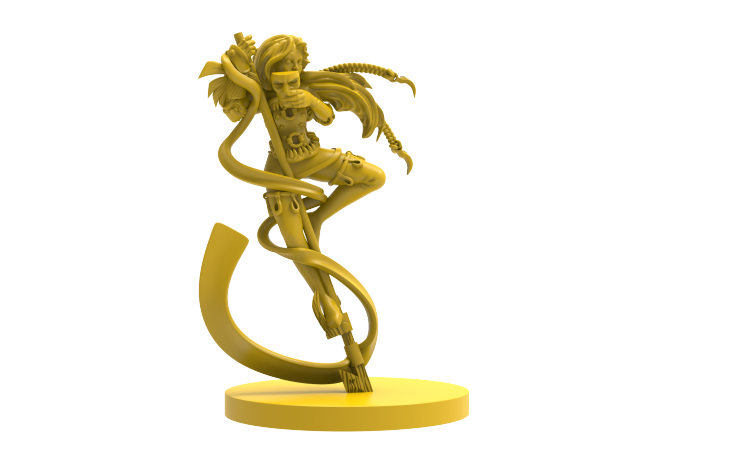 Finally, we’d like to add that tournament organisers are encouraged to give these sculpts out for any award they want to at their events, not just for first place. These sculpts are a big reason to want to attend Guild Ball events, so they need to be accessible to anyone that attends. You could award your blind alternate sculpt for your best painted award, most sporting opponent award, last place award, or even just as a completely random ‘draw a name out of a hat for attending this event’. SteamCon UK Design a Model, Minor Guild Edition! It’s become a SteamCon tradition that we would host a ‘design a model’ seminar to let you all experience a really short version of the process we go through to design new models. The fantastic part is, we will often (but not always) be able to put the newly created model into the game somewhere down the line! The Ratcatcher Squaddie Skulk is a fantastic example of an idea you had that we were able to put into the game. This year we took the seminar in a slightly new direction. This time we explained our concept for a brand new Minor Guild, allied with the Brewers, the Entertainer’s Guild! The Entertainers are a collection of stage actors who play the role of a series of myths and legends from the Guild Ball world. Guided by Steamforged Games developer Sherwin Matthews, this year’s seminar attendees created ‘Shark’ (work in progress title). As fluid and agile as the fish swimming through the ocean, the actor portraying the charismatic hero eschews violence of any kind, preferring instead to vault and dodge around the pitch and her opposition. After a massively successful Design a Model seminar in which nearly everyone agreed the direction of this exciting new player, Russ Charles created this awesome work in progress render, which we presented during the keynote. 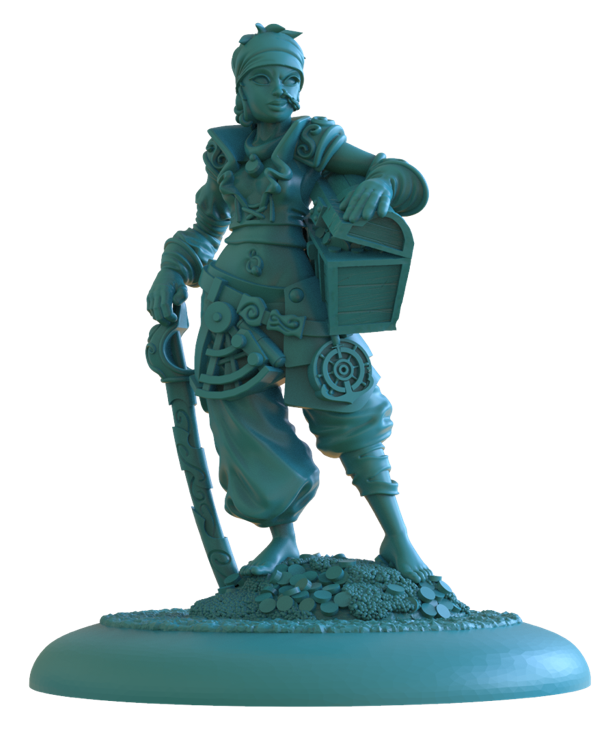 At SteamCon US we showed you the first half of the Miner’s Guild, the Engineer’s Minor Guild. Yep, the Minor Miner’s Guild… moving on! At SteamCon US we showed you the Captain, Shaft, along with two of the Squaddies, Fuse, and Mule. We also showed you the first crossover model from the Engineer’s Guild (an Engineer model who can play for the Miner’s Guild), Colossus. 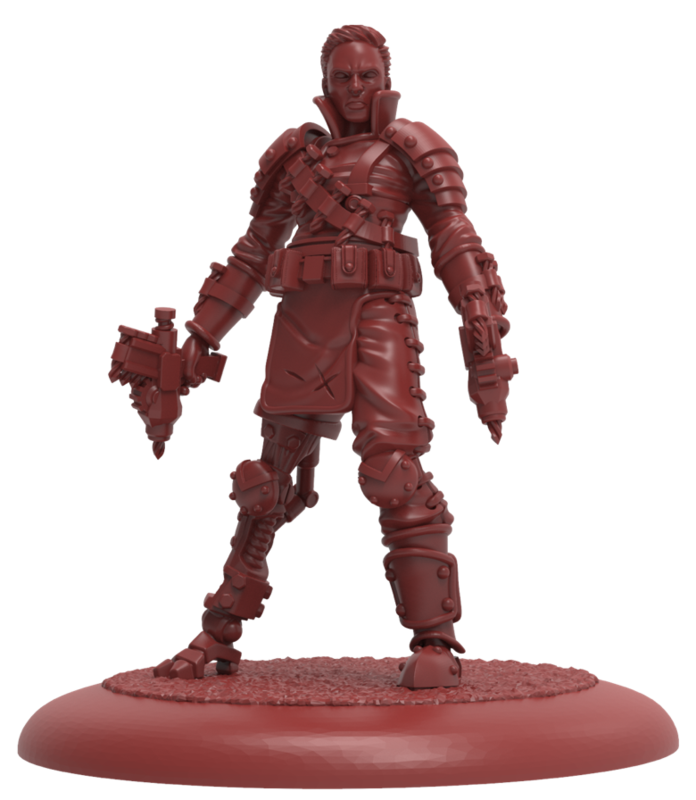 At SteamCon UK, first off we confirmed the second crossover model from the Engineer’s Guild, Salvo. 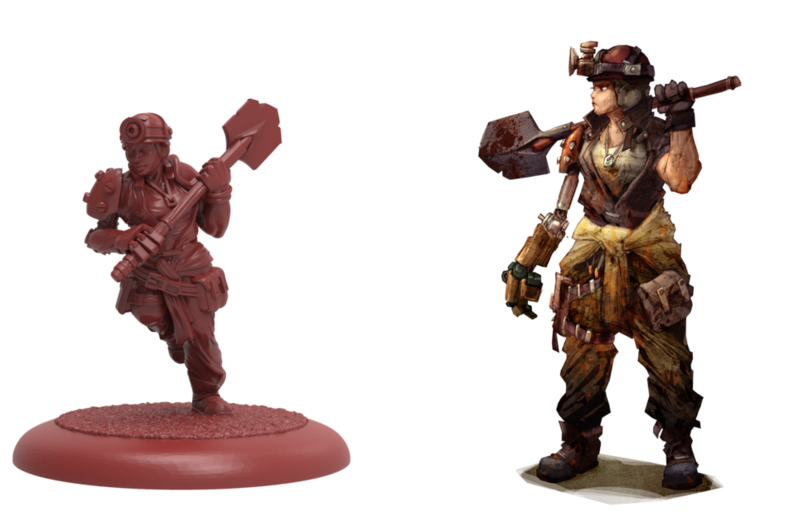 Both the alternate Colossus and Salvo sculpts will be available through the Miner’s Guild Launch Pack. So make sure your local store or gaming group runs a Miner’s Guild launch event! Next up, the mascot of the Miner’s Guild, a cute little steampunk mole called Digger. Finally, easily the most ambitious and possibly controversial Guild Ball model that we’ve ever attempted. The final squaddie model for the Miner’s Guild drives a 50mm based drill-tank and is called Fissure. We also gave away a sneak peek at the Miner’s rules by showing off their Guild Rule. Similar to the Navigators & Cooks, all 6 of the Miners will have this Guild rule on their cards. Secret Tunnel represents the Miners’ ability to dig through the pitch and pop up in a new location, or perhaps to uncover a tunnel they dug before the match event started, sneaky! Secret Tunnel works a lot like Vileswarm’s Scatter character play where, because it’s a ‘within’ measurement, you measure from the front of the model’s base, and then place the back of the model’s base on the far end of your measurement. This means that a 50mm based model like Fissure can actually move about 4” as a result of Secret Tunnel. That’s all for today folks, join us again for our next blog which will go into more detail about Steamforged Games Innovations and the two brand new games we announced for SFGI: Codenamed Nightmare Fiesta and Redline.